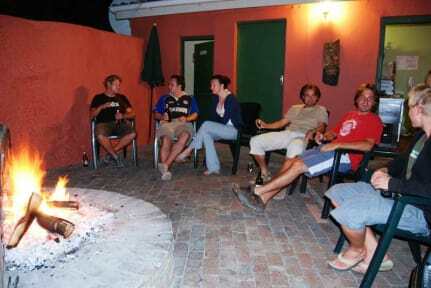 After 18 years in the business this friendly hostel still offers excellent service from staff who will happily share the secrets of the little Karoo and arrange a wide variety of activities from their adventure and travel centre. Stretching over four properties, nothing will cramp your style during your stay here. In fact, the relaxed atmosphere is a little addictive, so don't be surprised if you end up staying longer than planned. Once you've settled in, stay up to date with social networks via free wi-fi, grabba beer from the pub (which is far from any sleep desiring bodies), plonk your hot bod into the cool pool, chill in one of the hammocks and order something from the coffee shop and dig into some awesome home baked cakes! Sloth out in front of the telly or lay claim to the balcony and watch the sun blaze its way to bed. We loved everything about this backpackers. Very helpful, knowledgeable and friendly staff, self catering for those that want it or you can buy meals from them, or walk to a local restaurant. Try the Ostrich kebobs! Rooms were comfortable and clean and they have options for every type of traveler. Say hi to Zeus if you go! At first we wanted to stay here for only one night but we ended in staying two nights. The staff is really great and we enjoyed sitting at the fire at night. Loads to do here, I totally recommend the caves and doing a bike tour. Also the wildlife ranch is great. One of the best Backpackers I’ve stayed in. The owner and his son are extremely helpful and even more welcoming. Recommend doing the bike tour, it’s something different to the usual stuff on the garden route. One of the best hostels I have ever stayed in. That made us feel like part of the family. Great hostel! Very open and welcoming and had a good sense of security. Also appreciated the discounts you get for some restaurants and garden route destinations. A definite go to if you're planning your garden route! I loved this hostel. Great vibe and spacious. Wonderful bar and campfire. Nice place to stay, would go there again. Rooms were clean but extremely hot compared to other hostels, I never got any sleep. Also we had added costs of a shuttle from George which was arranged for us (we was traveling with baz bus which has the hostel as one of the stops) when we checked out we got asked to pay almost R400 for this which we was never told was an extra charge or even asked if we wanted to provide our own transport. Also don't go on their trips, waste of money. Really displeased - we were quoted 100 rand for a ROUND TRIP ride to the meerkats from the guy that works at the hostel but when the tour was over he didn’t answer his phone and we had to find our own ride back. Then the hostel still insisted we pay full price. It was a five minute drive. Also felt like they push the pricey bike tours and you just have to cycle back the way you came on the narrow highway. Would've been good otherwise - kitchen was really well equipped and the dorm was spacious.